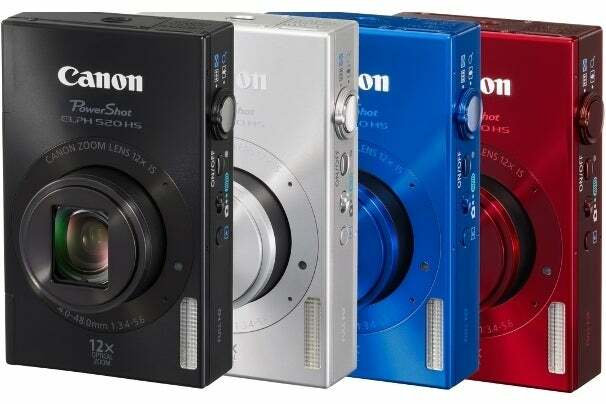 In addition to the ultra-powerful PowerShot G1 X announced this morning at CES 2012, Canon added two pocketable PowerShot point-and-shoots to its lineup today. Both new cameras offer "Intelligent IS," an automated feature that adjusts optical image stabilization according to whether the cameras are capturing in wide-angle, macro, full telephoto, or mounted on a tripod. The PowerShot Elph 520 HS will replace the Elph 500 HS in March of this year, boosting its optical zoom range significantly from 4.4X to 12X while somehow shrinking in size, while the PowerShot Elph 110 HS will replace the ultracompact Elph 300 HS model. The PowerShot Elph 520 HS will be the first Canon camera to use MicroSD cards as a storage format, as the company says it was necessary to use the smaller card format in order to shrink the pocket-size camera down to its 0.88-inch-deep size. The Elph 520 HS offers a 10-megapixel backside-illuminated CMOS sensor to go along with its 28mm to 336mm zoom range. It has a new, somewhat boxy physical design, which is far cry from the Elph 500 HS's curvy, angular frame. Canon's new pocket megazoom also ditches the Elph 500's touchscreen interface for a non-touchscreen 3-inch LCD. Also gone, presumably, is the Elph 500 HS's bright maximum aperture of F2.0; usually, long-zoom cameras don't have apertures nearly as wide. The new camera shoots 1080p video at 24fps, records stereo audio, and allows for optical zoom in video mode. New features include a "Face ID" setting, which recognizes the facial features of photo subjects and allows shooters to register them in the camera with their names and birthdates. Two new Smart Auto mode features are also built with babies in mind: an enhanced face-detection that recognizes when a baby is smiling and automatically shoots three continuous shots, and in-camera wizardry that recognizes when a baby in front of the lens is sleeping and silences the shutter while turning off the flash. The Elph 520 HS will also offer Canon's Digic 5 image processor, which the company says will lend multi-area white balance and the ability to automatically choose from 58 scene types to optimize exposure for the shooting environment. Due in March, the Elph 520 HS will cost $300 and be available in black, silver, blue, or red. 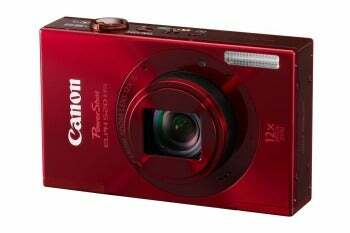 The 16-megapixel PowerShot Elph 110 HS doesn't have the optical zoom range of the other new PowerShot, but it's a direct-line successor to popular Canon models such as the Elph 300 HS and the PowerShot SD1400 IS. The Elph 110 HS takes standard SD cards, and it shares the same Digic 5 processor, 1080p video recording, and "Face ID" features as the Elph 520 HS. The new pocket camera also offers a 5X optical zoom lens (24mm to 120mm) and 28 scene modes that are automatically selected by the camera in Smart Auto mode. 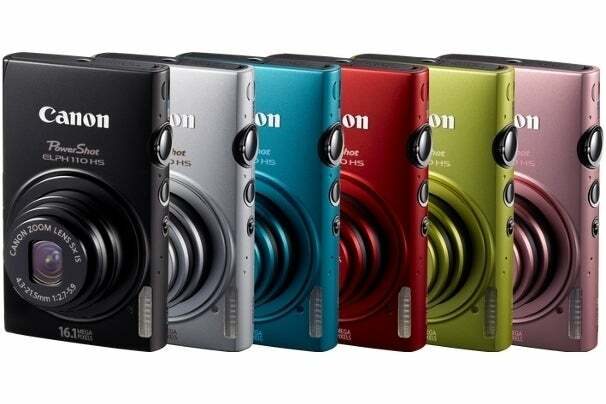 Due in mid-February, the Canon PowerShot Elph 110 HS is priced at $250 and will be available in a range of colors. The PowerShot Elph 520 HS is a very compact 12X-optical-zoom camera designed for casual shooters. It doesn't perform at the level we're used to seeing in Canon's cameras, and its MicroSD slot and lack of manual controls may give prospective buyers pause.